Have Ewe Any Wool? : The December Projects......DONE! Some projects that have been languishing and waiting for me to have the time to finish them have FINALLY been finished! Wahoo!!!! 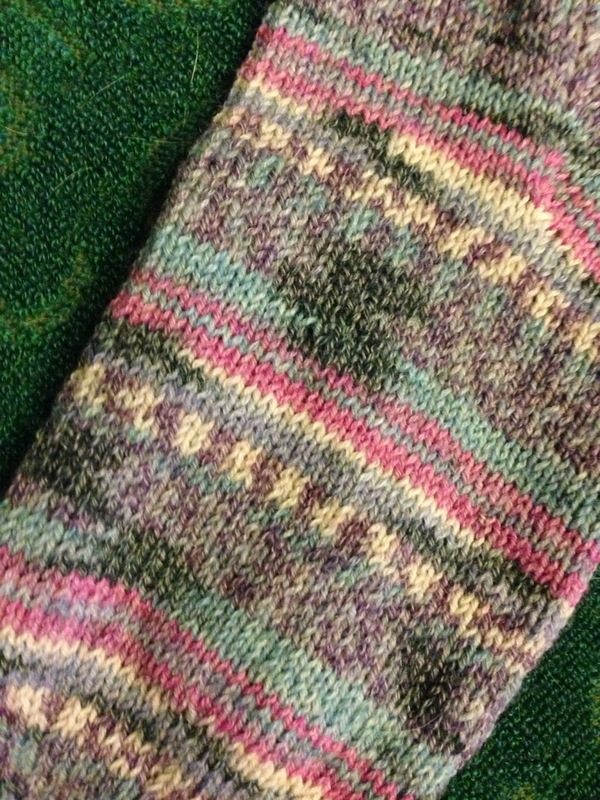 First off, the socks that were started several weeks ago.....my cotton-wool socks. I really like how these look - and I LOVE the pinks and purples. These socks are perfect for in-between seasons...or wearing indoors. 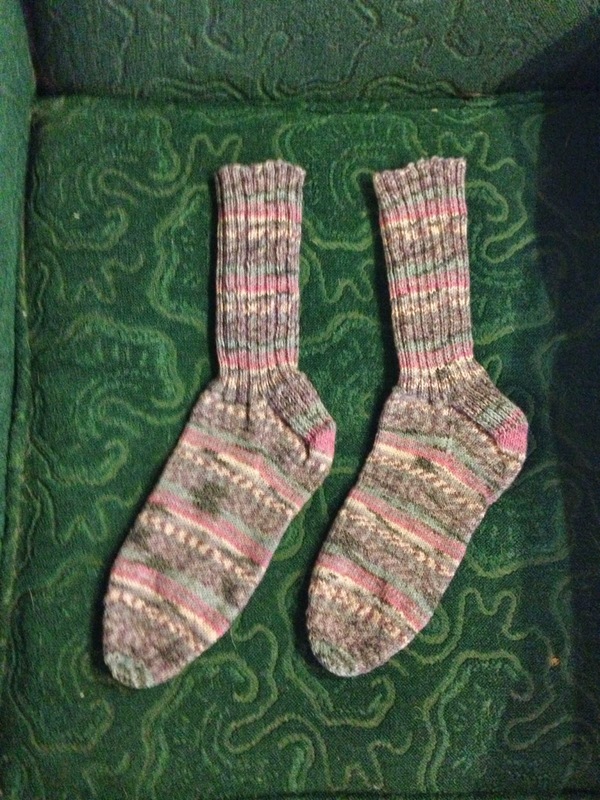 My feet get too hot in pure wool unless it's really cold. Perhaps I'll wear these to work on Friday? 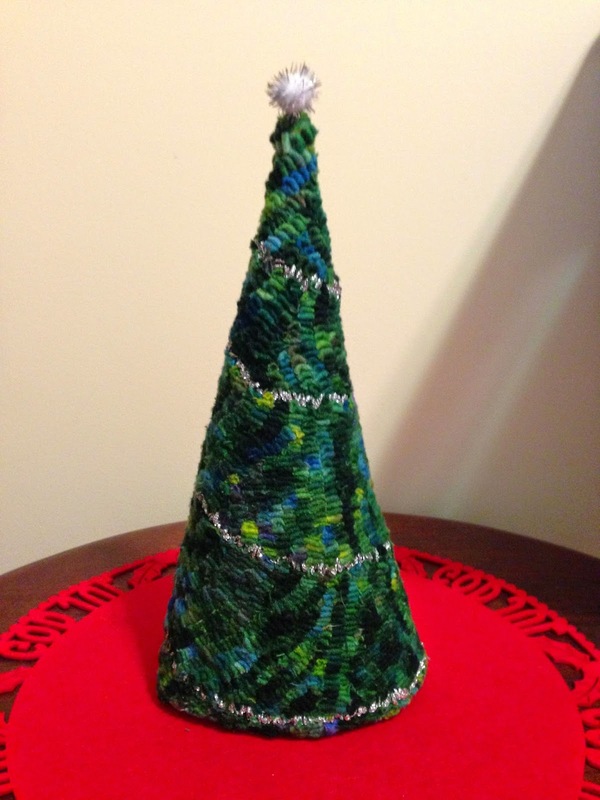 I finished the rug hooking of my tree earlier this month. And now, I've stitched it together and topped it with a pom-pom star! It's finally done....it took over a year for me to complete. I still haven't decided if I'm going to add a "tree skirt" to it....or mount it on a spool. For now, I think it looks fine just sitting on my Norwegian holiday table topper. I had a really hard time sewing it together - especially at the top. I had to miter it so it wasn't so bulky, and as a result, it started to ravel...making it even more difficult to stitch together. Plus, the direction I hooked (up and down) made it very easy to "expose" the backing as I bent the fabric to join it into the tree shape. If I do this again, I'll definitely hook it across, rather than up and down. Right now....I'm just satisfied that it's finally done!